Mice are masters at squeezing their way into your home through extremely small holes. Once inside, they can cause damage as they search for food or water, and when they build their nests. They can chew through your wires and cause your home alarm systems to go off! If that isn’t bad enough, mice also carry diseases that can affect humans (Hantavirus) or bring in disease-carrying fleas, ticks or lice. HOW DO YOU KNOW IF YOU HAVE A MICE PROBLEM? In some mice infestation cases, you may not see the mouse. Instead, you find mouse droppings that indicate you have a mouse problem. HOW DO YOU GET RID OF A MOUSE INFESTATION? 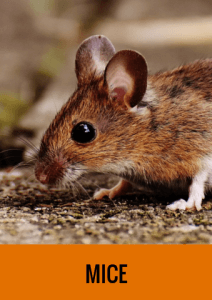 While you may be able to capture and remove the mice, if you do not identify and seal every possible entry into your home, they are sure to return. If you think you have a problem with mice, you should call in the professionals! 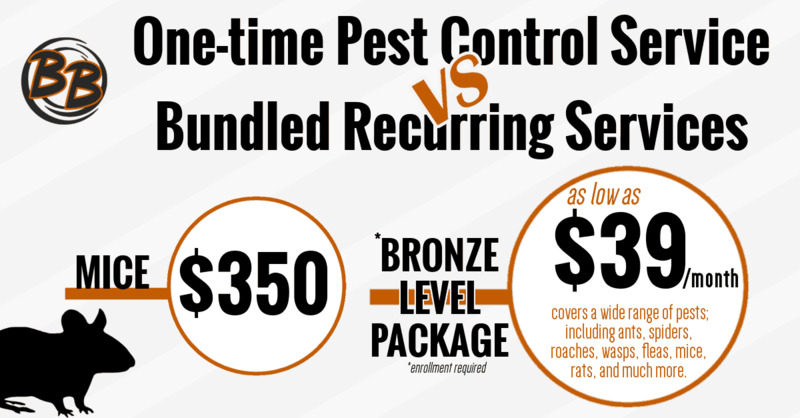 Depending on your location, we have one-time treatment of pests or year-round protection plans. Give us a call to inquire about the mice pest control service we offer in your area. WHAT TYPE OF MICE DO YOU HAVE IN YOUR HOME? Habits: The deer mouse prefers the outdoors. Habitat: The deer mouse makes its home outdoors in sheltered areas such as hollow tree logs or piles of debris. On the rare occasions the deer mouse comes indoors, it prefers undisturbed areas such as attics. Threats: The deer mouse transmits the potentially fatal Hantavirus Pulmonary Syndrome. The disease can be transmitted through contact with mouse carcasses, or by breathing in aerosolized urine droplets of infected deer mice. Prevention: To keep mice and other rodents out, make sure all holes of larger diameter than a pencil are sealed. Mice can squeeze through spaces as small as a nickel. Seal any cracks and voids. Don’t overlook proper drainage at the foundation and always install gutters or diverts which will channel water away from the building. Use heavy gloves and protective breathing gear when working in an area populated by deer mice. Habits:House mice can breed throughout the year and can share nests. Habitat: House mice live in structures, but they can live outdoors. Threats: Micro droplets of mouse urine can cause allergies in children. Mice can also bring fleas, mites, ticks and lice into your home. Prevention: To keep mice and other rodents out, make sure all holes of larger diameter than a pencil are sealed. Mice can squeeze through spaces as small as a nickel. Seal any cracks and voids. Don’t overlook proper drainage at the foundation and always install gutters or diverts which will channel water away from the building. SAVE 20% or MORE BY BUNDLING OF SERVICES! All our residential pest control services come with a satisfaction guarantee. That means that if the pests come back between services, we come back to retreat at no extra cost to you. PLATINIUM PACKAGE 20% Discount for First Year! GOLD PACKAGE Over 20% Discount for First Year! SILVER PACKAGE 20% Discount for First Year! BRONZE PACKAGE Over 20% Discount for First Year! Bug Buster’s Quarterly Pest Control Program covers a wide range of pests; including ants, spiders, roaches, wasps, fleas, mice, rats, and much more. Once we have taken care of any issues on the inside of your home, we will focus our efforts on the outside to keep the pests out. Exterior services will occur once every three months, and will include a foundation treatment, removal of wasp nests and spider webs using a telescopic tool that reaches up to 30 feet, and treating the crawlspace if you have one. However, if the bugs don’t listen, we will come back and take care of it at no additional charge to you. Bug Buster’s Termite Restoration Program allows you to have the peace of mind that your home is protected from termites. Termites cause more damage in Virginia each year than fires and natural disasters combined, and insurance companies do not cover termite damage. With the Termite Restoration Program, we will treat your entire home for termites, do a thorough inspection of your home every year, and restore that treatment every five years at NO additional cost to you. If termites are ever found, we will remediate them at no extra charge to you. Bug Buster’s Mosquito and Tick Control Program protects you, your family and your pets from the deadliest living organism on the planet. Imagine being able to sit in your back yard, in the middle of the summer, and not having to worry about getting bit. With our Mosquito and Tick Program, we will come to your home every month, April through October. Mosquitoes are not very strong flyers, and need to land a harbor every 10 feet, or so. What we do is eliminate the ability for them (and ticks) to harbor in those areas. While we are there, we will do a thorough inspection of your yard to find mosquito breeding sites which we will either treat or eliminate. If you are ever not satisfied, we will return and treat at no extra charge to you.